- Two boards each divided into five compartments. In nine of these compartments a large 10 is printed in black. - A set of cards, on which are printed the figures 1 – 9, which will slide into the boards, covering the ‘0’. Have the child unroll a long mat. Show the child the material and have him bring over the material. Sit at the mat so it is vertically in front of you. 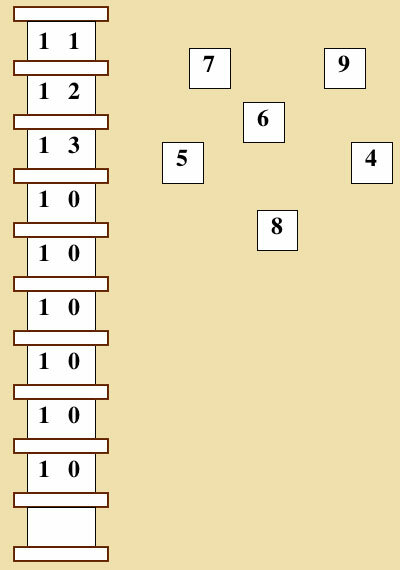 Place the two boards in a vertical line at the top of the mat. Place all of the cards, in random order, to the right of the board. Point to each until the child realizes that each has 10. Repeat to create 13 under 12. Do a Three Period Lesson for 11, 12, 13. For the 2nd Period, take out the cards and have the child “create” 11, 12, 13. Repeat, three numbers at a time until you have done 11-19. Have the child make the numbers 11-19 in random order directed by the directress. Have the child take out the cards and have him create 11-19 in order. Once the child is done, count all the numbers in order, and then backwards. To connect name and symbol.